In person, Kose is a company of Cosme Decorte, and brother company of Albion. It tends to be better to my skin, but they do not always perfect for my skin. 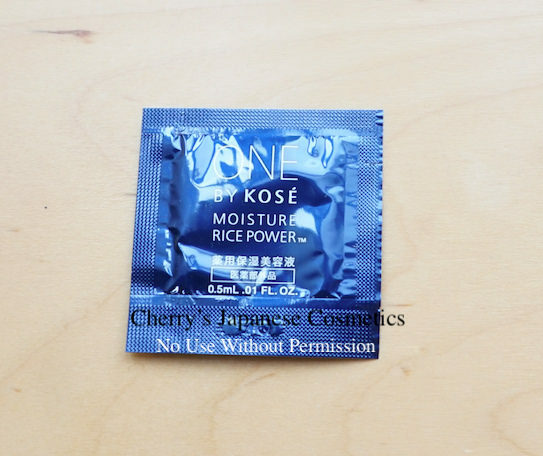 I got a sample of new skin care essence, “One by Kose”. They claim this is a booster moisturiser, aka apply this essence after your face wash, and go to your routine skin care. The half transparent essence is not pretty much rich texture. Indeed it is already June, it is a little one of the most humid months among the Japanese seasons, it was a little bit too rich to apply other skin care items. I thought due to my skin condition — not bad now, I should stop applying other items. It moisturised pretty well on my face. There are something slightly scent, it can be by rice. I prefer non-smelling skin care products. If you want to have this booster, please feel free to ask us.